Save $200-300 right now on limited early bird tickets. 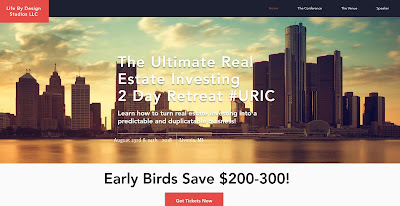 Learn the exact systems our firm uses to do over 100 flips & wholesales a year at the #URIC2 day real estate investment retreat. Livonia MI Aug 23rd and 24th. Save $200-300 right now on very limited early bird tickets. Join us for a 2-day Retreat for the real estate investing course that is changing not only the industry but peoples lives! Since the launch of the course in March of 2018 students of URIC have generated over $1,000,000 in net profits from fix and flips and rentals. Most students following the course 100% are getting their first deals in just 3-5 weeks! The Ultimate Real Estate Investing course is the only course willing to give you everything you need upfront for life and the only course that continues to grow with you as new content is added often, never any more upsells! Over the course of 2 intense days, we are going to dive into The Ultimate Real estate investing course and teach students everything they need to know on how to build what we call a “predictable and duplicatable” real estate investing business. How to achieve any number of flips or rentals you desire down to the exact numbers it will take! Here is some of what you will learn over this 2 day fully immersive Event! Introduction to the most common paths of real estate investing and understanding the differences so you can choose the path that best fits you. Quick Tips on dealing with Contractors and our entire renovation systems capable of doing 15+ flips a month! A 90-day blueprint and start-up plan, step by step to your first deal in 30-90 days. The importance of Role plays, scripts, objection tracking and increasing your skills. Join us for an event unlike any you have been to before 2 fully immersive days focused on you and building the business of your dreams!